This year’s 8th Annual Victorian Major Projects Conference, at the Melbourne Convention & Exhibition Centre 28th and 29th November 2017, was kicked off with a presentation by the Hon. Jacinta Allan MP, Minister for Public Transport, Minister for Major Projects. Minister Allan had previously spoken at Major Projects Conferences, and once again gave a comprehensive overview of what’s happing and what’s next for Victoria’s infrastructure industry. Delivering insight to the $5.5 billion West Gate Tunnel Project was David Clements, Program Director Major Projects Victoria Transurban. The project aims to provide improved access to and from the west on a safer, more reliable road system with less congestion and improved connections. Expected to be completed in 2020, the project will remove 9000 trucks from residential roads and boost the Victorian economy by approximately $11 billion. Overall, more than 110,000 tonnes of steel will be used in construction, 92 per cent of this will be sourced from Australia, 93 per cent of various other materials will also be sourced locally and this, in consequence, will create thousands of jobs all over the country. Lastly, Clements outlined that planning approvals would be finished in late 2017 and construction will begin in early 2018. Panellists Paul Byrne, Executive Director Planning, Infrastructure and Technical, Victorian Planning Authority; Nicola Ward, Manager City Planning, The City of Casey; and Richard Tomlinson, Professor, Urban Planning, Faculty of Architecture, Building and Planning, University of Melbourne, discussed planning for the increasing needs of residential infrastructure in Victoria. Byrnes believes that reducing the need for travel is central for infrastructure planning. Over the 40 minute period topics presented to the experts included identifying and prioritising infrastructure projects, the politics of spending, timing investment, affordable housing in relation to services, city builders as property developers versus specialised city developers , the inter-play between planning, land usage and integrating transport, and lastly, metro-scale governance. In a more general presentation, Paul Kenny, Partner, Sector Leader, Government, Allens, outlined the Victorian Government’s way of protecting communities while also harnessing government investment potential through the Victorian Value Creation and Capture Framework. Value creation refers to enhanced public value in economic, social and environmental outcomes; while value capture refers to governments gaining portions of economic value created by investment. Kenny discussed both the Framework itself and the legal intricacies and considerations that go into planning government documents such as this. A prominent news story, Peter Wilkinson, Director of Delivery and Development from the Melbourne Metro Rail Authority (MMRA), presented The Metro Tunnel Project’s latest project updates and timelines. Wilkinson outlined the current progress and plans taking place on multiple work fronts while simultaneous construction is being carried out in order to deliver the project as quickly as possible. Operators find that multiple inner-city stations often have trains queuing and the City Loop is nearing capacity. Not only will the project ease pressure on the rail network, but will also decrease the demands on tram services, with overcrowding a prominent concern. Wilkinson then described the early works that will begin the nine year construction process. Managing contractors are now relocating or demolishing current utility services, creating access shafts and other preparatory works; Tram diversion works are also being undertaken; and service providers are powering the construction process. Discussing plans for the Victorian Government’s $2.5 billion investment into school infrastructure was Chris Keating, Chief Executive Officer from Victorian School Building Authority. Established in 2016, the Authority aims to bring Victorian schools and early childhood centres into the 21st century. Keating explained that we need to fundamentally change the model of delivering schools while thinking of them as the centre of a community rather than just part of one. With over 1000 upgrade projects and 56 news schools being built, Keating reinforced that the Authority will be bringing a different approach to school infrastructure than previously seen in the region. Major focuses, apart from construction, is community engagement in the areas surrounding the schools and centres. Keating also explained the need for relocatable buildings as the industry of school infrastructure is heavily influenced by enrolment numbers and at other times by unforeseen issues or natural disasters. The City of Melbourne approximately has a $92.1 billion economy, a weekday population of 1 million, 455,800 jobs, 16,600 business and 2 million visitors annually; Arron Wood, Deputy Lord Mayor of City of Melbourne, outlined the need for the increase of green infrastructure in the municipality. Wood drove this need by explaining that Melbourne’s CBD temperatures are 4 degrees warmer than its surrounds and that there are approximately 200 heat-related deaths per year. Green infrastructure is a tool to combat this. Green rooftops were a main focus in Wood’s presentation as they not also cool buildings but also aid stormwater management, increase ecology and biodiversity, increase property value, increase amenity and help clean the air. It was also made apparent that there is 11 per cent less green cover in the City of Melbourne now than in 1988. Integrating greenery with infrastructure is also a step in the City of Melbourne’s Melbourne Renewable Energy Project. The visitor economy in Victoria contributes over $23 billion to the state’s gross state product. Peter Bingeman, Chief Executive Officer of Visit Victoria, presented to attendees why we should and how we can grow this industry even further through infrastructure. In projected estimates from mid-2015 to 2025, Tourism Research Australia outlines a $36.5 billion rise in expenditure from both day and overnight trips, which will consequently create 320,000 jobs related to the tourism industry. In the years 2015, 2016 and 2017 (with years ending in June), Victoria’s total tourism statistics rose 5.1 per cent, 8.3 per cent and 10.5 per cent respectively. Bingeman then continued to discuss the benefits and opportunities Victoria’s natural tourism provides. The state has 4 national parks, 35 per cent of Australia’s mammal species, 54 per cent of Australia’s bird species, attracts 1.6 million people to the 12 Apostles National Park each year, all of which are accessible in 2-3 hours by car. Visit Victoria aims to further utilise these aspects by creating better connectivity for travellers, more iconic infrastructure and additional regular events, the reasons behind these changes are because, as Bingeman explained, “opinion can change how a region is being perceived”. 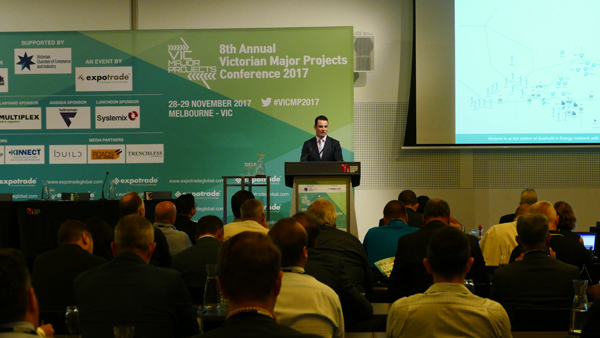 The 8th Annual Victorian Major Projects Conference 2017, held at the Melbourne Convention & Exhibition Centre on the 28th and 29th November, featured 15 other comprehensive presentations and a panel given by industry experts from across the country. The event also encompassed multiple specialised networking sessions for senior-level delegates to make connections and discuss their various projects. The 9th Annual Major Projects Conference 2018 will be held in September of next year.